For this month's "Maps Of The Month" featurette, I wish to draw your attention to YelseyKing's Tactics Ogre: Let Us Cling Together (J) (Super NES) maps. Valeria is a nation ravaged by war, with three groups fighting for leadership. After his home town is massacred, the protagonist Denam, along with his sister Catiua and his friend Vyce, seek justice against the Dark Knights, and fight to bring peace to the kingdom of Valeria. Though part of the Ogre Battle franchise, Tactics Ogre: Let Us Cling Together (J) features considerably different gameplay, and has become part of its own sub-series including the GBA prequel Tactics Ogre: The Knight Of Lodis. Tactics Ogre: Let Us Cling Together (J) also predates Final Fantasy Tactics (PSX), as well as Suikoden Tactics (PS2), Dynasty Tactics (PS2), La Pucelle: Tactics (PS2), Onimusha Tactics (GBA), Dungeons & Dragons Tactics (PSP), The Lord Of The Rings Tactics (PSP), and more, all strategy games with "Tactics" in their name, in an interesting case where games of different series but of the same genre share part of their title. With over 200 gorgeous maps of this landmark title, YelseyKing's first submission to VGMaps is clearly deserving of the Maps Of The Month honour. He has taken the time to render maps twice whenever applicable: one version with items indicated, and an unmarked version to admire the beauty of these isometric graphics. With no stone left unturned across all of Valeria, YelseyKing will surely help you and Denam lead the Liberation Army to victory! 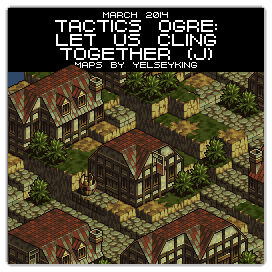 So to recognize the effort put into tackling this tactical RPG, YelseyKing's Tactics Ogre: Let Us Cling Together (J) (Super NES) maps will be known as VGMaps.com's Maps Of The Month for March 2014. ...wow, awesome. I... did not expect to get Maps of the Month honors, much less so quickly! I'm not sure what else I can rip, offhand, since most of the games I've played have already *been* ripped. I'd kinda like to do Final Fantasy Tactics one day, since that's a "spiritual sequel", but... with its maps being rotateable, that would be a fair bit tougher. Hm. Well, we'll see. Are you kidding? Considering how good the maps look and how many of them there are, it was only a question of time. It's well deserved too . Like I said it's nice to see another Ogre Battle game fully mapped. You could just make a new set for vgmaps. Holy crap, speaking of Ogre Battle I just found out there are tracks called "Ogre Battle" and "March of the Black Queen" on the second album released by the band Queen. Also the intro to their song "One Vision" was used as the final level music in the SNES puzzle game in Little Magic. Oh yeah, I was going to post that little bit of trivia but you beat me to it. There's also a song called "Teo Torriatte (Let Us Cling Together)". As I also learned on Wikipedia, the Rhyan Sea is named after "Seven Seas of Rhye". Ha! The Quest guys are fans of Queen, that's awesome. I wonder if they hid anything else anywhere in the games. Found another one. The boss fight theme from Zero the Kamikaze Squirrel is from the movie Dr. Otto and the Riddle of the Gloom Beam. Yep that's the one! I was wondering where it was from but couldn't think of it lol.